Uncovering the DNA manipulation strategies of viral attacks widens the path to future therapies. 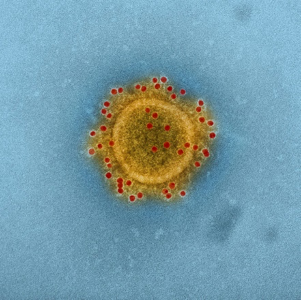 A Middle East Respiratory Syndrome (MERS) coronavirus particle. A new paper investigates changes in the epigenetic landscapes of MERS and H5N1 influenza virus, and how those changes reveal strategies of infection. In the last decade and more, new strains of coronavirus and influenza with pandemic potential have emerged, and now loom as significant threats to global public health. Among them are Middle East Respiratory Syndrome (MERS) and several strains of avian influenza virus. Diverse groups of viruses use diverse pathways to defeat host immune responses and to increase the success of the infection. Some of these infection pathways are distinct to an individual pathogen, but other pathways are commonly shared. This uneven viral antagonism is subjected to a comparison study in a new paper released online Jan. 15 by the Proceedings of the National Academy of Sciences. Its authors, including the contributors from the Pacific Northwest National Laboratory (PNNL), identify a shared mechanism used by a highly pathogenic avian influenza (H5N1) and MERS-CoV to evade immune responses. The paper highlights the way epigenetic modifications help govern disease outcomes and shape the common avenue used by H5N1 and MERS-CoV to sidestep host immunity responses. As the paper outlines, epigenetic alterations in DNA's chemical structure are triggered by the infectious coronavirus and influenza virus. In turn, the affected host-cell DNA alters the production of messenger RNA, the nucleic acid molecule that makes proteins. "It's like turning on or off a switch," says Mitchell of the epigenetic alterations, "although in this case the switch has many positions." For MERS-CoV, it is DNA methylation that likely suppresses the production of antigen presentation molecules, which are critical for generating an antiviral antibody response. The same is true for H5N1, though histone modification also plays a role in suppressing this response. Understanding these switches and their ability to turn off virus-fighting mechanisms gives scientists a greater understanding of how epigenetics modulates the host immune response following a virus infection. The paper's findings, the authors write, have "the potential to aid in the development of treatment and prevention strategies." These practical steps are not imminent, Mitchell pointed out, but the paper adds "an important bit of knowledge about viruses that can bring us closer to treatment strategies." Understanding the dynamics of such infections involves high stakes. Infections caused by MERS-CoV and by avian influenza virus can trigger severe disease and spur high mortality. They represent a continuing global threat as they emerge from zoonotic populations. The current study uses cross comparisons to leverage systems biology data in order to identify the key pathways and strategies that viruses use to subvert host responses. The researchers categorized gene expression by function and measured antigen presentation after infection by both pathogens. Antigen-related gene expression was confirmed by proteomics, a research strength at PNNL. Future studies will expand on this approach, exploring other aspects of immunity response, including inflammation, apoptosis (regulated cell death), and autophagy (regulated cell-component disassembly). The authors say that the same viral cross comparisons can be integrated across data types to identify additional metrics for modeling viral responses. Scientists can also use publically available data sets to survey contrasts in host responses among viruses. In all, the authors write, the approach outlined in the paper represents a "novel and powerful means" to understand viral pathogenesis and to eventually provide future directions for treatment. Research Team: Kristin E. Burnum-Johnson, Hugh D. Mitchell, Carrie D. Nicora, Samuel O. Purvine, Cameron P. Casey, Matthew E. Monroe, Karl K. Weitz, Kelly G. Stratton, Bobbie-Jo M. Webb-Robertson, Thomas O. Metz, Richard D. Smith, and Katrina M. Waters (PNNL). Vineet D. Menachery, Alexandra Schafer, Lisa E. Gralinski, Amy C. Sims, and Ralph S. Baric (main authors, University of North Carolina, Chapel Hill). Amie J. Eisfeld, Kevin B. Walters, and Yoshihiro Kawaoka (University of Wisconsin, Madison).